You are here: Home / INHERIT ALL THINGS / The inheritance of GOD in CHRIST JESUS, and those who shall inherit the inheritance. Brothers and sisters, you don’t have to work or labor for an inheritance, because an inheritance is something that is already laid up waiting for those to become mature, who shall inherit the inheritance. An inheritance is put away for a moment in time, waiting until those who shall inherit the inheritance are fully mature to receive it. Inheritance: The act of inheriting property. The reception of genetic qualities by transmission from parent to offspring. The acquisition of a possession, condition, or trait from past generations. Something that is or may be inherited. A valuable possession that is a common heritage from nature. Most people who claim to know GOD do not know GOD as much as they think they do, or as they should know him. Many people just know of HIS name, they know what other people say about GOD, they know religion, they know the traditions of men, they know the traditions of church, church politics, they know the pastor, second hand knowledge, gossip, hearsay, and second hand information about GOD. 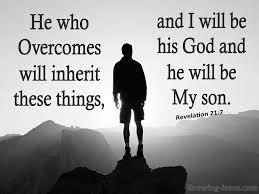 of GOD in CHRIST JESUS shall inherit all things. Brothers and sisters, there is a real inheritance laid up waiting for the people who know GOD, by the revelation knowledge of GOD in CHRIST JESUS, they shall inherit all things, and you shall know them by their fruit, because they know who they are, they know what they believe, they know who they believe in, and they know all things are possible for them in CHRIST JESUS, simply, because they believe. You will not see GOD’S chosen anointed begging GOD for things GOD has already promised them, and neither will you see them asking GOD for things He has already promised them. For why would you keep begging and asking for something you know has already been promised to you? Why would you keep begging and asking for minor blessings, when you know you’re going to inherit all things? You will never see a prince begging or asking to be King, for he knows he shall be King, because he knows the inheritance is already laid up waiting for him to inherit it. You can tell the difference between the inheritors and those who lack the revelation knowledge of GOD, by their words, for those who lack the revelation knowledge of GOD in CHRIST JESUS are always asking and begging GOD for things he has already promised them. They are always talking about what GOD is going to do, because they don’t know GOD has already done everything in CHRIST JESUS. Brothers and sisters, GOD is not going to do anything, because GOD has already done everything in CHRIST JESUS, GOD is just waiting on you to believe it, and receive it. Brothers and sisters, when GOD said, “IT IS FINISHED”, GOD MEANT EXACTLY WHAT HE SAID. (Revelation 21:6-7) JESUS SAYS, IT IS DONE. I am Alpha and Omega, the beginning and the end. I will give unto him that is athirst of the fountain of the water of life freely. (John 17:3-4) JESUS SAYS, And this is life eternal, that they might know thee the only true God, and Jesus Christ, whom you have sent. I have glorified you on the earth: I have FINISHED the work which you gave me to do. (John 19:30) When JESUS therefore had received the vinegar, he said,IT IS FINISHED and he bowed his head, and gave up the ghost. (Matthew 5:5) JESUS SAYS, Blessed are the meek: for they shall INHERIT the earth. (Matthew 19:29) And every one that has forsaken houses, or brethren, or sisters, or father, or mother, or wife, or children, or lands, for my name’s sake, shall receive an hundredfold, and shall INHERIT everlasting life. (1 Samuel 2:6-10) The LORD killS, and makes alive: he brings down to the grave, and brings up. The LORD makes poor, and makes rich: he brings low, and lifts up. He raises up the poor out of the dust, and lifts up the beggar from the dunghill, to set them among princes, and to make them INHERIT the throne of glory: for the pillars of the earth are the LORD’S, and he has set the world upon them. (Hebrews 6:9-20) But, beloved, we are persuaded better things of you, and things that accompany salvation, though we thus speak. For God is not unrighteous to forget your work and labor of love, which you have shewed toward his name, in that you have ministered to the saints, and do minister. And we desire that every one of you do show the same diligence to the full assurance of hope unto the end: That you be not slothful, but followers of them who through faith and patience INHERIT the promises. For when God made promise to Abraham, because he could swear by no greater, he sware by himself, Saying, Surely blessing I will bless you, and multiplying I will multiply you. Wherein God, willing more abundantly to show unto the heirs of promise the immutability of his counsel, confirmed it by an oath: That by two immutable things, in which it was impossible for God to lie, we might have a strong consolation, who have fled for refuge to lay hold upon the hope set before us: Which hope we have as an anchor of the soul, both sure and stedfast, and which enters into that within the veil; Whither the forerunner is for us entered, even JESUS, made an high priest for ever after the order of Melchisedec. (Jeremiah 12:14) Thus says the LORD against all my evil neighbours, that touch the INHERITANCE which I have caused my people Israel to INHERIT; Behold, I will pluck them out of their land, and pluck out the house of Judah from among them. Brothers and sisters, I am not begging GOD for anything, and neither do I keep asking GOD for things he has already promised me, because I know all things are possible for me in CHRIST JESUS, and I shall INHERIT all things in CHRIST JESUS, because I know the revelation knowledge of GOD in CHRIST JESUS, and because of my knowledge of GOD in CHRIST JESUS, I believe. For it is impossible for you to believe in something or someone you don’t know. THE INHERITANCE: Devolution of property on an heir or heirs upon the death of its owner. In civil law jurisdictions it is called succession. The concept depends on a common acceptance of the notion of private ownership of goods and property. Under some systems, land is considered communal property and rights to it are redistributed, rather than bequeathed, on the death of a community member. In many countries, a minimum portion of the decedent’s estate must be assigned to the surviving spouse and often to the progeny as well. Intestacy laws, which govern the inheritance of estates whose distribution is not directed by a will, universally view kinship between the decedent and the beneficiary as a primary consideration. Inheritance usually entails payment of an inheritance tax. (Romans 8:17-19) And if children, then heirs; heirs of God, and joint-heirs with Christ; if so be that we suffer with him, that we may be also glorified together.